The Senior Resource Fair on May 4 was very successful. There were about 40 organizations that had tables at the event. The free lunch (tamales, rice, salad, watermelon) was enjoyed by all. Police dog Bolo made an appearance with his West Sac PD trainer and was a hit. The Community Center provided very nice bags this year for the attendees to hold whatever they collected. Everyone who filled out a comment form was entered into the drawing... prizes donated by the City and by local businesses. 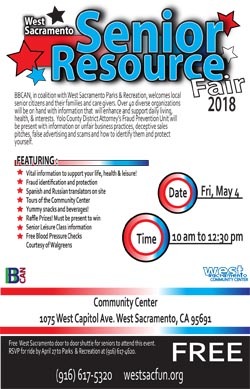 BBCAN, in partnership with West Sacramento Parks & Recreation, invites all local seniors, their families and caregivers to attend the annual Free Senior Resource Fair on Friday, May 4, from 10am to 12:30pm at the West Sacramento Community Center. Over 35 diverse organizations are invited to be on hand with information that will enhance and support daily living, communication, health and interests of seniors. Yolo County District Attorney's Fraud Prevention Unit will be present with information on unfair business practices, deceptive sales pitches, false advertising, scams and how to identify them to protect yourself. There will be free blood pressure checks, a voter registration table, raffle prizes, refreshments, and much more!